I purchased an inferior clock. It has Herschede Tempis Fugit on it. Is there any chance that someone put a Herschede face in a grandfather clock? The time line doesn't check out if the last ones were made in the late 60's. The story is that an elderly couple purchased it in the 80's. Honest to god it looks like pine! Is there any way to verify this? The clock works. 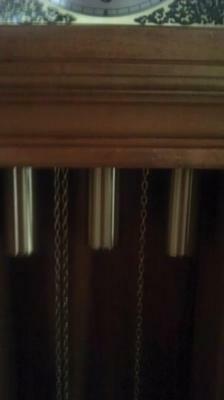 It has a pendulum and 3 weights. Is there any way to verify if this is real? Comments for Inferior herchede clock? Like many other companies, Herschede had a range of clocks to fit many budgets. You may actually have a Herschede clock in one of the less complicated versions, like without a moon dial. 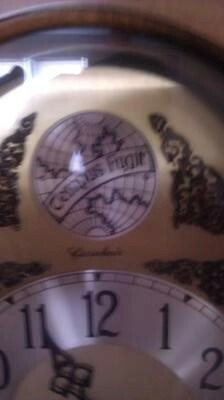 "Tempus Fugit," latin for "time flies" appears on many clock dials and has nothing to do with either branding or model. Does your clock play a melody or simply stick the hour and half hour? Another tell-tale sign is that it had rods in the back instead of tubes. Please feel free to email me, fantachris@msn.com, if you have any more questions.